Driven by proposed guidance from USP (<1220>) and the ICH announcement of new guidelines on method development and validation, Analytical Procedure (Method) Lifecycle Management is gaining traction within the pharmaceutical industry as an improved approach to developing and refining methods in order to increase robustness, reduce method failures, improve method transfer, and gain regulatory flexibility, and minimize investigations and re-validation. Waters recently surveyed 100 method developers from innovator and generic pharmaceutical companies to better understand their existing challenges and views on Method Lifecycle Management (MLCM). Some of the key findings are highlighted below. For more information about Method Lifecycle Management and how to begin implementing it, register for our free webinar, Introduction to Method Lifecycle Management, March 5, 2019, 10:00am EST | 3:00pm GMT. When it comes to developing and optimizing analytical methods, respondents identified several barriers including: existing technologies, limited time, lack of training and education, regulatory guidelines, reluctance to change, and disruption to current workflows. In general, most respondents reported that their organizations are eager to develop and/or optimize existing analytical methods, and would be more so if the barriers would be eliminated. While respondents seem to be relatively flexible in developing new methods, there was a large discrepancy between their organizations’ effectiveness at anticipating and mitigating risk, and how effective they should be. This correlates well with the high percentage of people who identified various barriers to changing their analytical methods. On the other hand, respondents indicated a strong enthusiasm to be more open about adopting a method lifecycle management approach. But a plurality didn’t feel like they had the tools and resources to be more proactive about it. If your organization asked you or your colleagues to be more proactive about looking at the entire lifecycle of a method and being more open to changing your current approach to methods, how enthusiastic could you be about this initiative? Do you currently feel like you have the tools and resources to be more proactive about a lifecycle approach to methods? 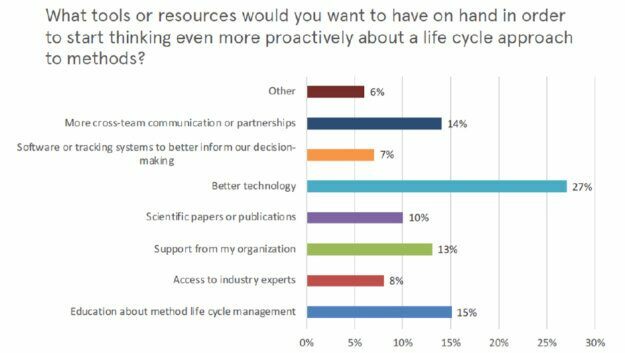 Finally, when asked what resources are needed for method developers to begin being more proactive about adopting a method lifecycle management approach, better technology, education, and cross-team communications were cited as the primary tools (Figure 6). If you’re looking to learn more about method lifecycle management and how to begin implementing this approach at your company or institution, register for our free webinar, Introduction to Method Lifecycle Management, March 5, 2019, 10:00am EST | 3:00pm GMT.